so that's why the packages always show up late or broken. uhh, ok...4 for great randomness. >__> Random, indeed. Yeah, I would get a larger picture but I haven't been able to find one. Then again... it has been awhile since I looked. 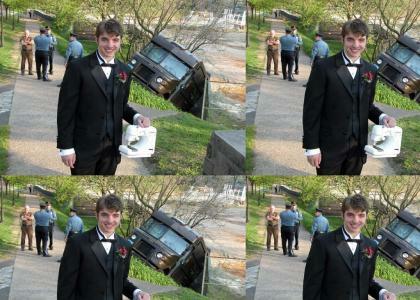 I suppose he's taking that sewing machine to Prom? This site is useless without citations!!! LOOK OUT!!! THAT UPS TRUCK IS ABOUT TO GET HIM!!!!!! dirt truck, comin this way! WHO4!1! H3 ST0L3 TH4T GUYS P1ZZ4!11! this picture is worth a thousand WTF's! Rofl. If I ever were to see a truck like that, sideways and sh*t, I'd laugh so much. The UPS truck looks emo. Hmm. Answers the question of "What can brown do for you?" I actually yelled "WHAT?" when I saw that. WTF is going on? Despite the music, I like this.